65 degrees in mid-December in Ohio? Perfect. Some say it doesn’t feel like the holidays, but I always say there’s nothing more festive than wearing shorts and a t-shirt while listening to a little Christmas music and reading some bogus tech-story analysis. A study indicates that text messages ending with a period are perceived as less sincere than those with no punctuation. Exclamation points, on the other hand, indicate more sincerity than no punctuation. In nine states, semicolons are grounds for divorce. Can It At Least Help Me Get The Name Right? Google and NASA jointly purchased a quantum computer two years ago. It has proved to be 100 million times faster than a single core computer in solving a particular type of problem. * Unfortunately, that problem was not “what the hell should Mike get his wife for Christmas.” Which means she’s probably looking at another gift card to that Bed Bath and Body Works and Beyond place. Amazon Prime members in Manhattan can now take advantage of one-hour delivery service for beer, wine, and spirits. “Found something for my Wish List!” said hard-to-buy-for uncles. Australia is investing nearly a billion dollars to make the country more inviting to tech startups and reduce its reliance on the mining industry. In a related story, I’m grudgingly investing $40 a month on an ISP to make my house more inviting to internet access and reduce my reliance on my neighbors’ non-password-protected WiFi. They don’t seem in any hurry to upgrade to the 30Mbps tier, and right now when they both get on to play Battlefront it’s almost pointless for me to use their Netflix log on credentials. Yahoo has decided to keep their 15% stake in Alibaba, known as the Ebay of China, and instead spin off the rest of Yahoo into a new company. This is apparently a Google/Alphabet type of restructuring with various complex balance sheet advantages making the company more attractive to shareholders. It does raise an interesting financial question for Wall Street insiders: In the story Ali Baba and the Forty Thieves, is Ali Baba a hero fighting the thieves or is he the leader of the thieves? All I remember is “open sesame,” which, to be honest, I really remember better as the cartoon version where Popeye is standing in front of a blocked cave saying, “Open, says me.” Anyhow, if you’re selling things, do you want to be associated with thieves? Questionable branding, if you ask me. But I guess I shouldn’t let my ignorance of eastern literature make me question an obviously successful business. I think I’m just nervous my thousand (minimum order) Death Star ice cube molds aren’t going to make it here from China in time for our Star Wars marathon party on Thursday. Google is introducing Shared Albums to Google Photos, allowing users to send an album to others, who can add their own photos to the album. Nice idea, with one problem. You have to trust the people you’re sharing with. “So just share with people you trust,” you say. A reasonable response, except I don’t trust anybody. Sure, I’d trust my family with my car or my house or my life, but with a photo album? Right. I guarantee that if I share an album from our family reunion with ten other family members, they will each add a hundred pictures, and somewhere in those thousand shots will be a hilarious series of Uncle Paul seven beers in and trying to make out behind the shed with Aunt Sally’s sister, Mindy (Aunt Sally being Uncle Paul’s wife). On his way to second base with Mindy, Paul abruptly disgorged approximately one cubic foot of hot dogs and three-bean salad on Mindy’s shoes. A laugh riot. Except my face will have been swapped in for Paul’s in every photo, and I’ll be the one dealing with Mindy’s fuzzy, drunken memories. Uber has been blocked in China from using the messaging app WeChat, a severe hindrance for a company dependent on communication with potential riders. This brings up one of those funny language idiosyncrasies you occasionally run across, like “Aloha” meaning both “hello” and “goodbye.” The explanation for Uber’s ban can be translated from the Chinese as “malicious marketing activities” or, more loosely, “WeChat is owned by Tencent, an investor in an Uber competitor.” Weird, huh? Apple is now supporting 100,000 songs in their $24.99 iTunes Match, up from 25,000 songs. Assuming an average of three-and-a-half minutes per song and sixteen waking hours a day, this would allow you to listen to your music for a year before you heard the same song twice. “How much to store twelve songs?” asked every pop music radio station ever. * I don’t know. Something about “using quantum annealing for an optimization problem involving 945 binary variables.” I’m pretty sure not all those words are real. Thanks, as always, for reading the Weekly Tech Views Blog, and an additional thanks to those who have picked up my collection of WTVBs, The Internet is Like a Snowblower (And 200 Other Things I Got Wrong About Tech This Year). Hope it brings back fond memories of things that may not have actually happened this year. 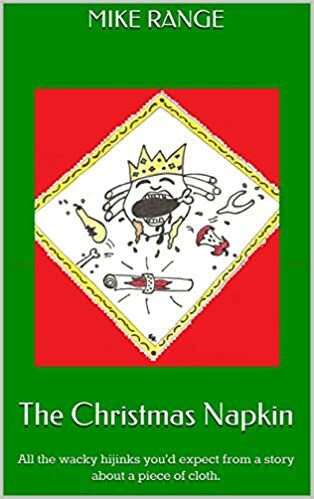 If you have already made that commendable purchase, or haven’t, but find yourself at Amazon browsing books about, say, internets and snowblowers, why not take a minute to pick up a free (starting Monday) copy of the holiday classic-in-waiting The Christmas Napkin. This short story has nothing to do with technology, but is at least as ridiculous as what you read here. The origin story of that most beloved of holiday icons–The Christmas Napkin–is free Monday, December 14 through Wednesday, December 16. If you are reading this after Wednesday, it will also be free on Christmas Eve and Christmas Day. See you next week (and beware the Beast of Brymlar! ).